Qoppa Software is finalizing preparations for JavaOne 2012 in San Francisco October 1-3. The event theme, “Make the Future Java”, echos Qoppa’s commitment to the ever-evolving technology on which our suite of multi-platform PDF products are based. Qoppa returns this year to JavaOne because the 11 year old software company chooses to deliver only 100% Java code to our worldwide customer base that crosses industry boundaries. Qoppa’s commitment to our Android Java product line underscores that commitment to delivering portable PDF code. Qoppa’s booth (#5506) at JavaOne will offer live demonstrations of the PDF manipulation capabilities it delivers in class libraries, web components, desktop applications, information flow servers, and mobile devices. Java developers will once again be able to directly discuss potential development and deployment scenarios with Gerald Holmann, president and founder of Qoppa Software. Qoppa Software’s booth #5506 is located in the Java Exhibition Hall (Continental Ballroom at the Hilton Hotel). To schedule a meeting time with Qoppa’s president Gerald Holmann or to claim a friend pass to the events, email Susan at javaone2012@qoppa.com. This entry was posted in Java PDF Library, Qoppa Software Events and tagged Event, JavaOne, Qoppa Software; events; PDF solutions on August 9, 2012 by qoppacom. Register as a friend of Qoppa to save on your conference pass! 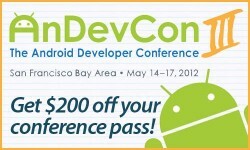 We’ll be at AnDevCon III, the technical conference for software developers building Android apps, on May 15 and 16 in booth 505. We’re excited to showcase our Android qPDF Toolkit. Qoppa President Gerald Holmann will be available for personal demos and business or technology discussions. Based on our own proprietary PDF technology, qPDF Toolkit helps developers easily PDF-enable Android apps, including the ability to digitally sign PDFs right on the Android device. Since AnDevCon II, Qoppa has delivered many changes and additions to our Android PDF apps and to our Java PDF libraries and GUI components for developers. Stop by Booth 505 to see live demonstrations of our qPDF capabilities on Android devices including PDF rendering and markup, form filling, document manipulation and digital signatures. This entry was posted in Java PDF Library, Qoppa Software Events and tagged AnDevCon, Android libraries, Android PDF, announcement, Digital Signature, Event, Java Libraries, Qoppa Software on April 18, 2012 by qoppacom.